Early Childhood Children in Nonparental Care: A Review of the Literature and Analysis of Data Gaps Factors associated with reduced expulsion in center-based early learning settings: Preliminary findings from the National Survey of Early Care and Education (NSECE) Learning about Infant and Toddler Early Education Services (LITES): Summarizing the Research and Gaps on Compelling Models Child Care Quality: Does It Matter and Does It Need to be Improved? Children with employed mothers were more than twice as likely to participate in non-parental ECE as those with mothers who were not employed: four-in-five children with an employed mother were in some type of non-parental care arrangement, compared to only one-in-three children with mothers who were not employed. For children younger than three, those with employed mothers were consistently more than four times as likely to participate in ECE as those whose mothers were not employed. The largest increase in the use of center-based care over this time period occurred among infants and toddlers with employed mothers. 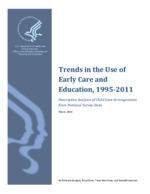 Among employed mothers who paid for infant and toddler care, there was a shift from non-center care to an increasing use of center-based care during this time period.